Note: Version 1.3.1 is now available. This release adds tailwind support. Release 1.3, released yesterday, adds support for the 800/900 variants. 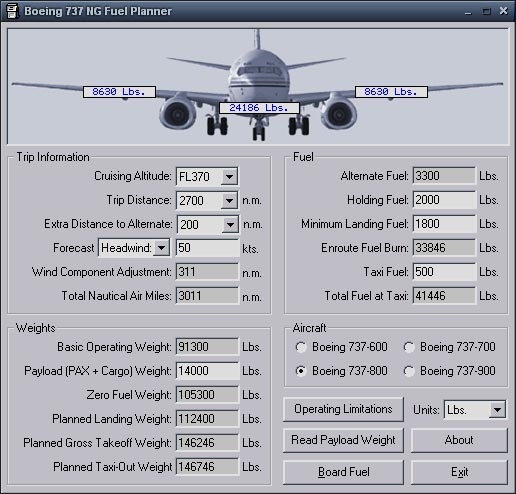 737NGFP is a fuel planning and boarding utility for Microsoft Flight Simulator. It is specifically designed to work with the Boeing 737NG developed by Precision Manuals Development Group, but it should work well for other 737NG aircraft provided they have the same operating limitations and fuel tank capacities. This simple utility is intended to be run just after you configure your aircraft for passengers and cargo using the PMDG load planner utility. (737NGFP can read the total payload weight directly from the aircraft if MSFS is running.) You then enter a few variables about your trip, such as total distance, distance to your alternate airport, and planned cruising altitude. You can also enter the amount of fuel you wish to have on board for taxi, holding, and reserve. The utility will calculate the total fuel required and show how many pounds or kilograms of fuel should go into the wing tanks and the center tank. Using FSUPIC, you can actually board the fuel with the press of a button. Supports 737-600, 737-700, 737-800 and 737-900. Values can be entered and displayed in pounds or kilograms. Reads payload (passenger and baggage) weights via FSUIPC. Calculates enroute fuel burn based on cruise altitude and trip distance. Calculates fuel burn to reach alternate airport. Calculates increased or reduced fuel consumption due to forecast winds enroute. Allowances for taxi-out fuel burn, holding fuel burn, and minimum landing fuel. Indicates if any parameters exceed aircraft operating limitations. Sets actual fuel levels in your aircraft via FSUIPC. One simple .exe file, no external DLLs or data files required. Loads first 1,000 pounds of fuel into the center tank to keep pumps submerged. Fully FSUIPC accredited for use with non-registered copies of FSUIPC. Note: This program is a work in progress. So far, I have only tested it on my system running Flight Simulator 2004 and FSUIPC 3.129, though others have downloaded it and used it successfully with FS2002. Use this software at your own risk. I am not liable for any damage or loss of data resulting from the use of this software. Simply save the file to your hard drive in any folder you like. Double click the file to run it. Note: Flight Simulator with FSUIPC must be running in order for the program to read your payload weights or set your fuel levels. You can still run the program without FSUIPC, but you will have to manually enter your payload weights and manually set your fuel levels in each tank. I've only tested the program with FS2004, but it should work fine with FS2002. After starting up Flight Simulator, run the Fuel Planner. The program will automatically recall the values you were working with the last time you ran it. First, select which aircraft you will be flying using the radio buttons on the right-hand side of the window. This affects the operating limitations of the aircraft, as well as estimated enroute fuel burn. Next, select the weight units you would like to use, pounds or kilograms, from the dropdown list at the bottom right corner of the window. Next, select your trip distance, cruising altitude, and distance to your alternate airport from the dropdown boxes in the upper-left corner of the window. Choose the option that matches your trip the closest, rounding up. Next, enter the average forecast winds during the enroute portion of your trip. Select "Headwind:" or "Tailwind:" as appropriate. The program will calculate the increased or reduced air miles that will be traveled as a result of the winds. Next, press the "Read Payload Weight" button. This will read your current settings for passenger and baggage weights via FSUIPC. The value should appear in the list of weights at the bottom-left corner of the window. Alternatively, you can manually enter the total weight of passengers and cargo in the box provided. Next, enter values for holding fuel, minimum landing fuel, and taxi fuel. Reference the PMDG documentation for good values to use here. You can enter only whole-pound or whole kilogram amounts here, with no commas or decimal points. At this point, you've entered all the information that is required. Each time you changed a value, the program recalculates the required fuel and resulting weights. If any value exceeds the operating limitations for the selected aircraft, it will be shown in red. The resulting fuel distribution among the wing tanks and center tanks will be shown in the boxes superimposed over the aircraft image at the top of the window. Note that the first 1,000 pounds of fuel are loaded into the center tank, then the wing tanks are filled, then any remaining fuel is added to the center tank. This is done to meet a manufacturer requirement to keep the fuel pumps submerged in order to prevent vapor ignition by stray sparks from the pumps. When you are satisfied with the fuel load, press the "Board Fuel" button to actually set the levels in each wing tank and the center tank. The program will fill the wing tanks before boarding any fuel in the center tank. That's it! Feel free to (Ross Carlson) with suggestions or comments. Enjoy! Support higher flight levels and arbitrary trip/alternate distances. Added support for 800/900 variants. © Copyright 2003 Metacraft Internet Services. All rights reserved.